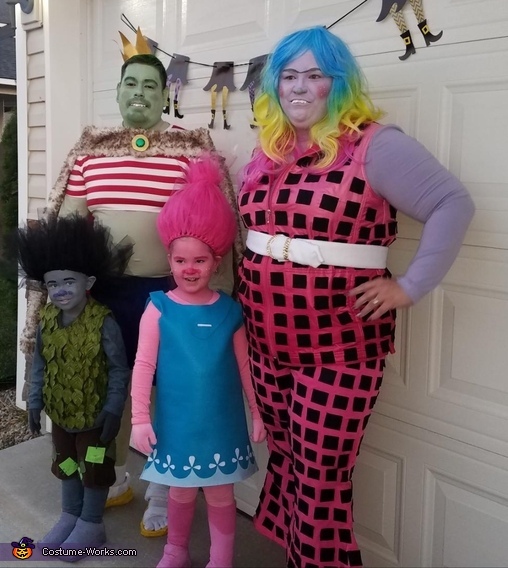 This homemade costume for families entered our 2017 Halloween Costume Contest, and won 3rd place in the Best Family Costume nomination! I started putting these costumes together (minus djsuki) in Sept. starting with the "skin" pieces. Branch & Poppy costumes cost about $14 each except for the face paint which we had from last year. These 2 where super simple to make with a basic glue gun and felt, starting bigger and trimming where needed. King Gristle was a little more work and $30 total. I found a leopard print blanket at a 2nd hand store that I used for the trim of KG felt cape. White leggings had to be dyed to match the "skin" shirt, face paint mixed to match, had the shorts already, waldo shirt purchased online along with the toe socks. second hand shoes covered in felt. Crown is card stock and gold paint, brouche is cardboard and a glass rock, all these items I had on hand. Lady Glitter Sparkles proved to be the most difficult and cost the most at $40. I found the vest 2nd hand but couldnt find pants in the correct pink. I decided to learn to sew, found a close color at the fabric store and managed to create wearable pants on my first try :) Next was cutting each black felt square out and gluing them on. I bought a white wig online and sharpies in the colors needed (wig dying tutorial on youtube was most helpful) shoes are 2nd hand & belt was mine but purchased white felt to cover it. djsuki was a last minute idea since branch (my nephew) didnt want to take pictures without his mom. "skin" for this was purchased at walmart in the kids section, we had white leggings, white shirt and colored felt on hand. headphones are 1/2 foam balls from walmart covered in felt. all troll hair is tulle and pipe cleaners. all shoe covers are mens socks, cut and dyed as needed. How can I get the Gristle and Lady Glitter Sparkles costumes?